On the morning of Dec. 23 we arose to the announcement that we would not land at Brandy Bay after all. Weather and ice conditions were simply too bad. 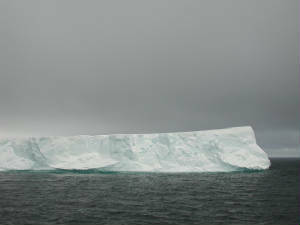 Instead, we would proceed through the Antarctic Sound and possibly make an afternoon landing on the peninsula itself. The morning passed quickly enough. We were all in need of some down time, and after lunch I indulged in the luxury of a nap beneath the cozy quilts that covered our bunks. 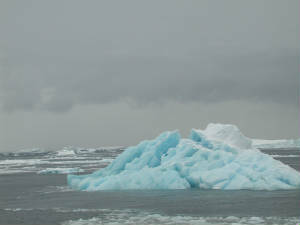 After about half an hour I woke and looked out my cabin window to see a seal passing by on an iceberg. As I stirred myself to take a closer look I saw there was a penguin too. It definitely called for a closer look. Beyond the icebergs on both sides of the channel were spectacular mountains, some in the perfect cone shape of recent volcanoes. Our ship pulled in towards the line of mountains on the left and found anchorage. This place was named View Point. It would be our landing for the day and our last chance to set foot on the Antarctic mainland. View Point overlooks Duse Bay, named for Lt. Duse of the Nordenskjold Expedition, who was one of the three castaways at Hope Point. The trio discovered the bay in 1903 as they tried to make their way to the main encampment on Snow Hill Island. We were now on a part of the peninsula claimed by Chile, and the Chilean government had provided a refuge hut, apparently for the use and protection of explorers stranded here. Most of us climbed up the hill to the hut just to have a look, then followed a rough track to the end of the ridge for a breathtaking view of the bay. A bitter wind made us shiver in our parkas, while above us two gulls circled and dove in an aerial ballet. 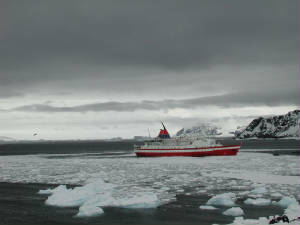 Out on the bay the pack ice stretched, creeping perilously near to our little red ship. It seemed a good idea to head back, and some of us began to retreat toward the boats. But Christmas was in the air, and there was plenty of snow - perfect snow, fluffy white snow, just right for rolling in and for…snowballs! Canonneers at the front, Captain Marc in the rear. The good guys have won, and that's only right. When we returned, the ship’s company was setting up for a Christmas celebration. In the lounge, the Filipino cabin staff decorated a Christmas tree, and a huge penguin in Santa Claus cap adorned the sideboard in the dining room. That evening we had our Gala Christmas Dinner – served two days early because on Christmas Day we would be once more in the merciless grip of the Drake Passage. Philipp, the Austrian chef outdid himself with a six-course banquet that started with veal liver mousse, proceeded through lobster bisque, beef ragout, wild berry sorbet, and grilled salmon, and ended with warm Black Forest cherries ragout on cinnamon ice. After dinner we moved to the lounge upstairs to watch Billy Crystal and Robert De Niro in Now Analyze This. The movie was hilarious, but we didn’t see the end because we once more heard the call of a whale sighting. I ran for my parka and saw that the captain had again opened the bow area for closer viewing. Our ship had slowed almost to a stop to observe the leviathan surfacing and blowing just in front of the ship. It was a large humpback, and Chris, the ship historian, noticed that it was displaying some unusual behavior, rising from the water and lunging down to get larger mouthfuls of krill – something that is called lunge feeding. The ship’s engines stopped, and we glided so close to the whale that we could hear the great whoosh of its breath. It was 11:30 PM, but still light enough to see details of the great animal as it surfaced just in front of us - even to the knobs on the top of its head. Text and photos by Carol Holtzman Cespedes, Ph.D.